What is Endoscopic Retrograde Cholangiopancreatography and What Purpose Does It Serve? Endoscopic retrograde cholangiopancreatography (ERCP) is a procedure that a doctor uses to examine the liver, bile ducts, and pancreas. It combines an upper gastrointestinal endoscopy and x-rays to allow the doctor to assess disease of the affected areas and organs. During the procedure, the doctor inserts a thin, flexible tube (endoscope) with a light and camera into your throat and passes it down to your small intestine. The doctor passes a thin catheter tube through the endoscope and into the bile ducts, then inserts a special dye called contrast medium into the tube to make the ducts more visible on x-rays. Before an ERCP procedure, we’ll ask you to fast 8 hours to ensure we are able to see your upper GI tract clearly. We may provide you with specific dietary instructions and/or any temporary adjustments to your medication. When you arrive for your procedure, we’ll have you to change into a gown. Then you’ll lie on your back and a specially trained ERCP staff member will give you a sedative to help you relax and make the procedure more comfortable. Once the procedure begins, your doctor will guide the endoscope down your esophagus through your stomach and into duodenum (upper part of the small intestine). 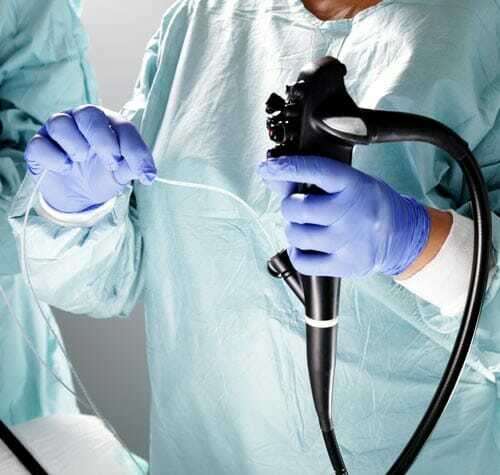 Air pushed into the endoscope will inflate the duodenum and give the doctor the best view of the affected areas. The endoscope will channel a catheter to the bile ducts and deliver a contrast dye for x-rays. The endoscope will also capture images of your liver, bile ducts, and pancreas. They will display on a monitor for the doctor to review and analyze. If you need a biopsy, the doctor will guide instruments into the endoscope to take tissue samples. The doctor may also open blocked or narrow ducts, break up or remove gallbladder stones, or insert stents to stop bile leaks. An ERCP procedure generally takes 1-2 hours. After the procedure you may experience bloating, nausea, or a temporary sore throat and difficulty swallowing. Most patients can resume normal activities and diet when swallowing returns to normal. Your doctor will follow up with you to discuss your exam results and let you know if you need additional exams or procedures.